Cannon Raceway circuit layout is changed several times a year making it one of the most popular and innovative go kart tracks in the UK. It has well maintained Pro-Karts equipped with catalytic converters and runs a state of the art track management computer system, a large electronic scoreboard, with high resolution monitors and full race printouts. The circuit is a member of the National Karting Association and complies to the very highest safety standards. All of the safety equipment necessary is provided as part of the package including full-face helmets, race suits, gloves and balaclavas and there are several race formats to choose from. For groups of 13 or more drivers:Practice plus 2 x 15-lap heats and a 10-lap final for the top 8 drivers. 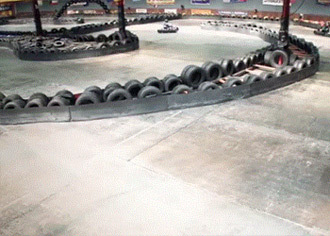 A 120-lap team endurance event. Qualifying to determine your grid position then a non-stop relay event for teams of 3 drivers sharing a kart. First class corporate hospitality facilities at this venue make it the ideal selection for entertaining clients, office parties or as conference entertainment to let off some steam. Contact our staff to discuss your groups requirements.